April 14, 2017 – Although galaxy formation and evolution are still far from being fully understood, the conditions we see within certain galaxies — such as so-called starburst galaxies — can tell us a lot about how they have evolved over time. Starburst galaxies contain a region (or many regions) where stars are forming at such a breakneck rate that the galaxy is eating up its gas supply faster than it can be replenished. 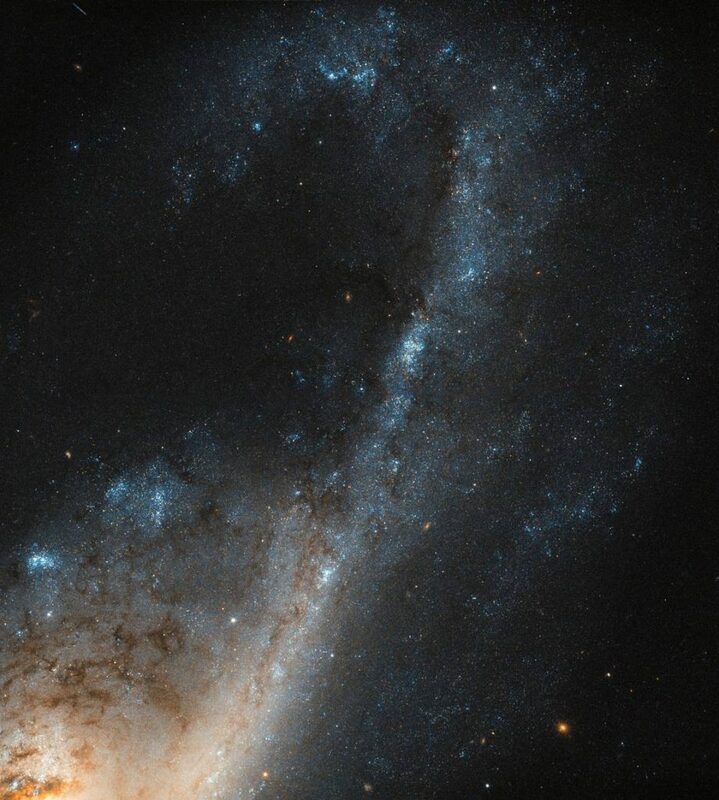 NGC 4536 is such a galaxy, captured here in beautiful detail by the Hubble’s Wide Field Camera 3 (WFC3). Located roughly 50 million light-years away in the constellation of Virgo (The Virgin), it is a hub of extreme star formation. There are several different factors that can lead to such an ideal environment in which stars can form at such a rapid rate. Crucially, there has to be a sufficiently massive supply of gas. This might be acquired in a number of ways — for example by passing very close to another galaxy, in a full-blown galactic collision, or as a result of some event that forces lots of gas into a relatively small space. Star formation leaves a few tell-tale fingerprints, so astronomers can tell where stars have been born. We know that starburst regions are rich in gas. Young stars in these extreme environments often live fast and die young, burning extremely hot and exhausting their gas supplies fairly quickly. These stars also emit huge amounts of intense ultraviolet light, which blasts the electrons off any atoms of hydrogen lurking nearby (a process called ionization), leaving behind often colorful clouds of ionized hydrogen (known in astronomer-speak as HII regions). Hubble’s Wide Field Camera 3 (WFC3) was built by Ball Aerospace in Boulder, Colorado. The Hubble Space Telescope is a project of international cooperation between NASA and the European Space Agency. NASA’s Goddard Space Flight Center in Greenbelt, Maryland, manages the telescope. The Space Telescope Science Institute in Baltimore, Maryland, conducts Hubble science operations. STScI is operated for NASA by the Association of Universities for Research in Astronomy in Washington, D.C.